As technology expands to phones, cars, home speakers and refrigerators, people charged with creating increasingly complex technology solutions have reached a conclusion: They need to be casting a broader net. One such example is in Montgomery, a city that has been enjoying an economic boom of late. The Capital City marked $546 million in capital investments in 2018, the largest investment number for Montgomery County since Hyundai rolled in more than 15 years ago. 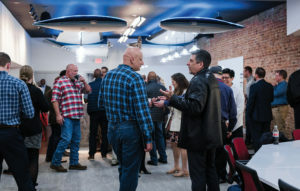 On the tech front, city leaders recently welcomed MGMWERX, a freestanding tech hub placed in a cozy downtown storefront, with all the usual tech embellishments of exposed brick, high-quality caffeine machines and an internet portal big enough to launch a Death Star. It’s being run by newly named Executive Director Steve Werner, a U.S. Air Force veteran with 30 years’ experience who most recently served as an instructor for the Air Power Research Task Force for the Air War College at Air University. Werner’s experience includes electromagnetic spectrum dominance, information systems, and software and systems engineering. MGMWERX is a project of DEFENSEWERX, a 501c3 nonprofit. The Montgomery office was created last year to attract new expertise to military challenges and align with the education initiatives of the U.S. Air Force’s Air University. So, why open such a thing when Air University is just a few miles down the road at Maxwell-Gunter Air Force Base? Besides the fact that techies don’t always fit the military mold — piercings are bad to set off metal detectors at the gate — there’s also some indication that tech answers now emerge in different ways. As Werner explains it, about 5,000 Air Force personnel pass through Air University in Montgomery each year, with another 25,000 involved through distance learning. They’re generally assigned to do research to help define or understand a specific problem or issue. 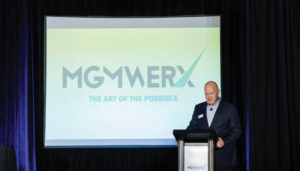 MGMWERX can now add experts to weigh in, either at the hub or anywhere in the world, through e-conferencing. Air Force Lt. Col. Brian Lebeck, of Air University, visits with Scott Kempshall, president and CEO of HyALTA Aeronautics Inc.
What do participants get? Besides service to their country, there are commercial possibilities. The Air Force gets royalty-free use of ideas generated at the hub, but if the idea is shaped into a commercial application, the person or company that generates it may end up benefitting from that commercialization. In January the hub selected three winners at its first-ever Pitch Night. Air University’s Lt. Col. Jason Trew earned top honors for his concept of the Icarus Institute to integrate design thinking across professional military education. Ethan Rudd received $7,000 to continue R&D for his Multi-Modal AI-Augmented System for Low-Visibility Conditions. Scott Kempshall got $3,000 in research funds for HyALTA, a hybrid lighter-than-air and flying wing air vehicle. Dave Helms is copy editor for Business Alabama.